Flying on a helicopter to the isolated highland village of Dolpo, seeing through Dolpo’s most fascinating highlights riding a Pony is one of our most luxurious treks in Dolpo. 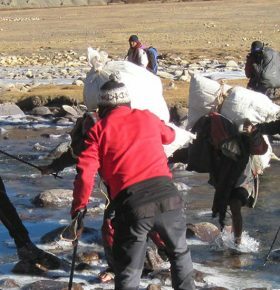 This luxury trek in Dolpo caters many amazing aspects of the region seen during long and strenuous treks in Dolpo. 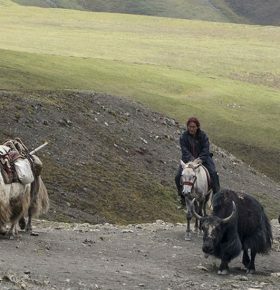 This luxurious Pony Trek with Explore Dolpo begins at Yangzer. Riding a Pony on the high trail of Great Himalayan Trail our luxury trek in Dolpo winds through few most important villages of Dolpo all the way to Phoksundo Lake. From Phksundo Lake, we fly back to Kathmandu. This trek is especially design for those travelers who have dreamt of seeing the best of Dolpo but are willing to skip weeks of trek. So, this Luxury Dolpo gives you an easy access to the highland of Dolpo and takes you to the most interesting places of Dolpo including the fabled Shey Gompa and Nature’s pride- the Phoksundo Lake. 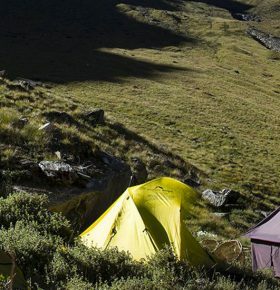 This Luxury Trek in Nepal is considered easy in terms of walking but when it comes to elevation, the trek goes as high as Kang La Pass 5240m- hence it is considered a moderate trek. Today, we will board a helicopter from the Kathmandu Airport and fly to the elevated village in Dolpo Yangzer 4599m. 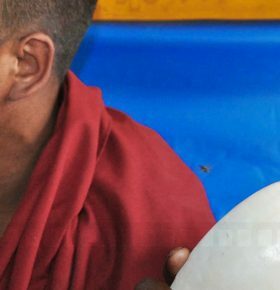 The flight throughout from Kathmandu to Yangzer is full of surprises. The landscapes change every couple of minutes. The cities turn into green hills and deep gorges through, which raging Himalayan Rivers flow and gradually we enter the barren region of West Nepal, where the peaks soar to to skyline in North. On our arrival at Yangzer, we will explore around the village and tour around the Gompa of the same, which is considered one of the most religiously Gompas of entire region. Witness the cultural difference, which is so contrast to the culture in Kathmandu at Yangzer and eventually think for while- do these two places are in the same country? Overnight in the camps at Yangzer. Today, we will begin the Luxury Pony Trek in Upper Dolpo. Before beginning the trek make sure you are comfortable to ride a Pony. 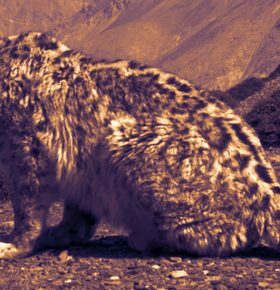 We will exit out of Yangzer with a gradual downhill climb to Nagao Khola, cross it over a bridge and wind through the barren regions of Dolpo, where the absolute peacefulness prevails. Following trail on the bank of Nagao Khola (River) we tread on almost leveled trail and cross pass several yak herder's camps and pasture lands to slide down to Saldang. Stroll through the fascinating cultural village capturing the photographs for a while in Saldang and let your Ponies be fed. The views of the Tibetan hamlet include mani walls and stupas. 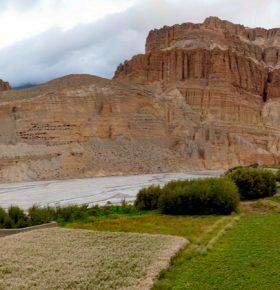 Down the village lanes and around tilled barley fields, we reach our campsite in Saldang, which lies just above historic Saldang Gompa. Saldang Village covers the largest the area largest village in the Nangkhang region of Dolpo. Among few options to explore around Saldang, first one is to hike to some of the northern villages north of Saldang. During autumn, we have a feast for our eyes as the highland hamlet is in the full swing harvesting season. Namgung Gompa. Explore the Gompa in the Village and capture the mesmerizing landscapes and appealing culture of Upper Dolpo. Enjoy the lunch at Nmagung and then head towards Shey Gompa. 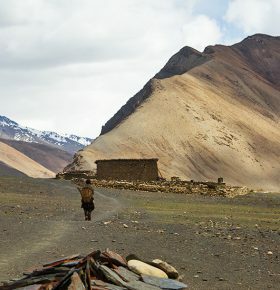 The landscapes during this part of the trek are typical Dolpo landscapes- barren and enchanting. Kagmara and Riu Dhukta, or the Crystal Mountain, to the West. The final push downhill from the pass, which is almost an hour of ride to Shey Gompa. Overnight in a camp at Shey. The Luxury Pony Trek in Upper Dolpo now exits out of Upper Dolpo, and enters into the region of mystical lake. For this we and our ponies have to cross the Kangla pass . The ride to the top of Kang La Pass is along the graveled trail uphill for 2-3 continuous hours. However, all the efforts our ponies put to come up to the top of pass rewards us with wonderful views. The eyefeasting views from the Kang La Pass includes Cyrstal Mountain, the mountains in Tibetan territory and the mesmerizing landscapes of Dolpo. We also have views of the peaks Shey Shikkar and Kang Chunne, both just over 6000 meters, before descending steeply down to the High Camp of Kang La Pass. Overnight in the camp at Kang La High Camp. The Luxury trek in Dolpo on a Pony today slides down the pass to Sallghari- the forest camp the major camping site during the trek other way around. Beyond Sallghari our Pony walks through the forest trail for quite a while. Then it begins to walk along the trails beside Phoksundo Khola- the river that feeds water to Phoksundo Lake. Cross passing a Damside of Phoksundo Lake, the Trek now enters the most treacherous trails of Dolpo that hangs on the cliff right above the lake. The sixth day of Luxury Pony Trek in Dolpo continues with the exploration around the lake. We would walk to the hill from where the water in Phoksundo Lake exits out in a form of high cascading waterfall. We can enjoy the magnificent view of Kanjiroba just at the backdrop of Phoksundo Lake. We would also walk around the lake, which manifests its unique features. Like it changes its colors with the sunlight of different times of the day and the lake is devoid of life. We will also hike up to the village of Ringmo (a Bon village), which lies just above the lake for a short cultural exploration. After the whole day of exploration around Phoksundo Lake we walk back to our camps. The Luxury Pony Trek in Dolpo ends today. Enjoy the views of the Phoksundo Lake and its vicinity just before you board the helicopter. The helicopter will fly back to Kathmandu. On your arrival at Kathmandu, we will transfer you to your hotel. We had a fantastic time. We have just returned from a fantastic 3 week holiday with Explore Dolpo trekking agency. The remote lands of Dolpa welcomed us with fantastic landscape and varied trekking. Our guide spoke the local language, fluent English, was knowledgeable about the area and was always willing to help. The porters were friendly, hard-working and great cooks. I was extremely satisfied with the service provided by the agency. They even helped to find us a helicopter to replace our postponed flight. A weakness of the trip was that sometimes the food was very carbohydrate overloaded with potatoes and rice, or potatoes and pastry. It is however, very remote and difficult to make a varied diet. It would have been nice to have had Dal Bhat more than we did. The pasta was sometimes served without sauce, which was a bit dry. The toilet tent also needed a skylight, or area in the top of the tent to let light through as it was very dark. I would also recommend you purchasing lighter tents. Really happy with the trek overall and would highly recommend your company to others. Our trekking dated from 4th August 2014 to 24th August has been very interesting and almost all has gone well. We want to underline the great professional help given by Aite Bhandari and all the staff: they were very kind with us and they have understood very well our needs. Thank you for your great management. Our trekking dated from 4th August 2014 to 24th August has been very interesting and almost all has gone well.